Menu at the Le Petite Syrah cafe. 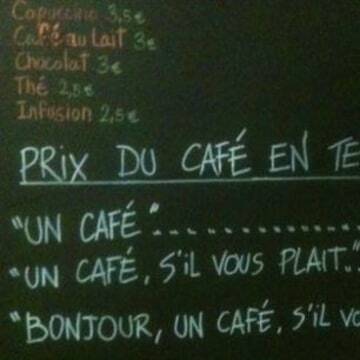 Prices posted at a cafe in France suggest that a spoonful of politesse will sweeten the prices for a cup of joe. Ordering simply "a coffee" at the Le Petite Syrah cafe in Nice runs you 7 euros, about nine-and-a-half dollars, according to the prices on the chalkboard menu. But add "please" and the price drops to 4.25 euros, about six dollars. 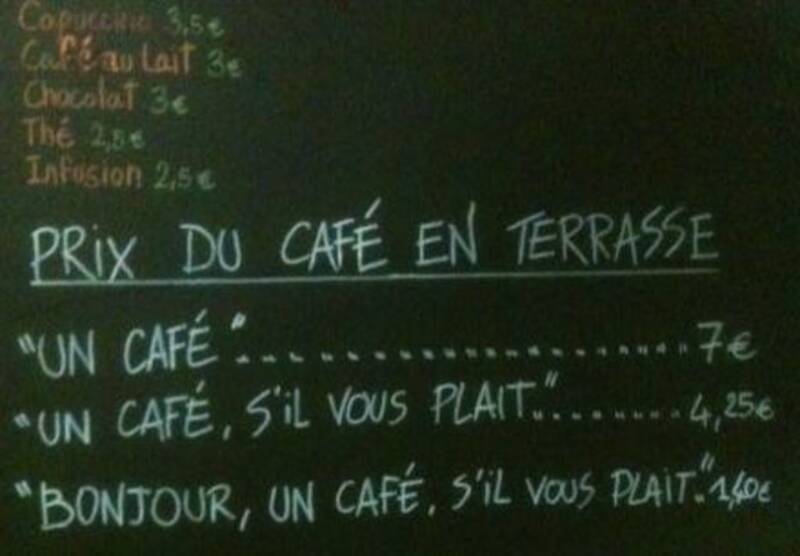 Go for the full, "Good morning, a coffee, please," and the politeness discount gets even steeper, 1.4 euros, or two bucks. In a nation whose waiters are famed for their perceived rudeness, that takes some gumption. But cafe owner Fabrice Pepino said it became almost necessary. "We're just a tiny restaurant with my wife and I'm also the wine waiter in the wine shop," he said. "We started to notice at lunchtime people are a bit more rude and stressed and were sometimes rude to us when they ordered a coffee." The sign, inspired by those he saw in Italy and France, started as a joke -- he's never charged more than 1.4 euros for a coffee. "I don't even think it's legal," said Pepino. But it has made his customers act differently. "They started at the beginning to say, 'Hello, your highness, will you serve me one of your beautiful coffees," he said, "exaggerating it even more polite than the sign to try and get free coffee." Mostly though, it has amused customers and helped them relax. "The sign reminds us that we are still human beings. It doesn't matter if the guest is the president," he said. Pepino was bemused that the photo of the sign, which he put up in the summer, went viral after a French journalist passing through tweeted a photo of it. French TV stations started calling him up right away wanting to descend on his shop. "The world is too fast," he said. "We are too stressed by this world. That's the same as how this Internet has reacted to this sign." Contact Ben Popken via ben.popken@nbcuni.com, @bpopken, or benpopkenwrites.com.